This is a family recipe that I've tweaked over the years. It's super easy to make and it's delicious. I like to batch cook this by doubling the recipe and freezing the sauce in meal portion sizes, so there's never an excuse not to eat healthy even on the run! 1. Sweat the chopped eggplant by sprinkling with salt, putting it in a paper towel-lined colander and placing a plate weighted down with the tomato cans on top for an hour. 2. Heat oven to 400 degrees. Season the chicken with salt and pepper and cook until just cooked through, about 45 mins. Remove meat from the bone and set aside. 3. In a large saute pan, cover the bottom with olive oil and saute the eggplant for about 5 minutes. This may need to be done in batches. Transfer the eggplant to a paper towel lined bowl. 4. Using the same pot, add a bit more olive oil and saute the onions until soft (about 10 minutes), then add the garlic and saute until fragrant (about 5 minutes). 5. Toss in the canned, chopped tomatoes with the reserved juice, plum tomatoes, eggplant, chicken, basil, red pepper flakes, and salt and pepper to the pot. 6. Bring to a boil, then reduce to a simmer for 40 minutes. And Voila! Simple, easy, and healthy! 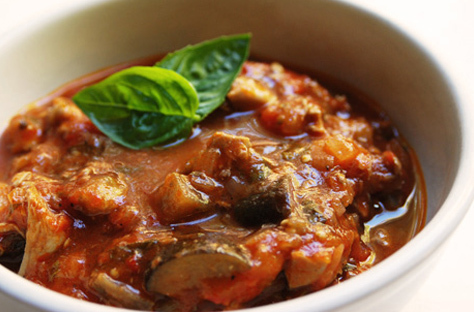 Enjoy this dish alone as a stew, or like our large Italian family on top of pasta or quinoa! Catch Janine's classes at Soul Rye Brook and Soul Scarsdale! Questions or comments? Email blog@soul-cycle.com!